European rose tea and eucalyptus. The older I get, the more I begin to appreciate the slower moments in life. I've learned to embrace the little things, to enjoy tiny luxuries, and to live slowly in a fast-paced world filled with the rush of deadlines. I have had a hectic past few months between interview prep, presentations, and work. 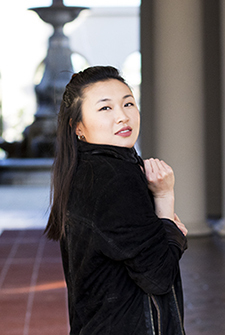 In that time, I especially appreciated the tiny luxuries that helped me slow down for a few moments in each day which can be self care, in my opinion. Here are the small treats that have I've been enjoying, all of which impart a wondrous aromatic experience. A small luxury I've recently discovered is European Rose tea, from Bird Pick Tea & Herb. My friend Roberta introduced me to them and after having this tea at her house, I picked up 2 oz. of it myself on a recent trip to Old Town Pasadena. 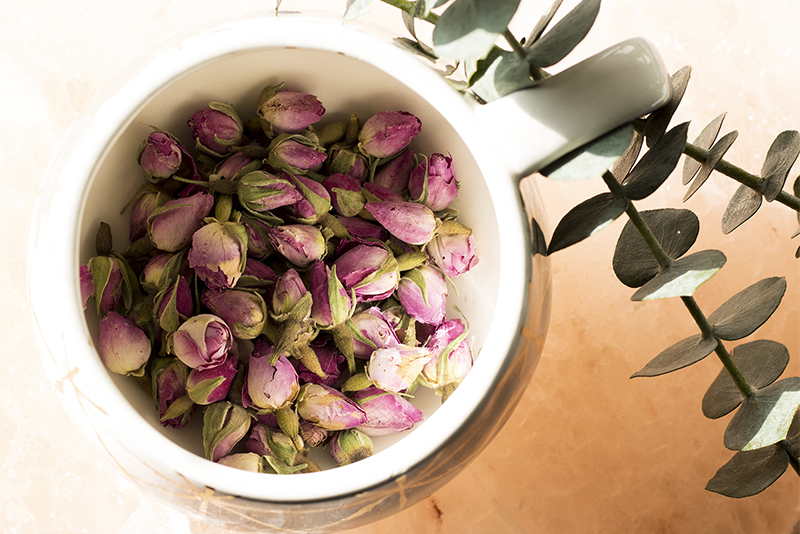 As you can see from the picture above, the loose tea is made up on dried rosebuds. It's an aromatic, non-caffeinated tea that's perfect in the evenings. I put the rose buds into a tea infuser, steep for about 4 minutes, and finish off the tea with a dash of honey. I find that a tiny bit of sweetness can really bring out the flavors of an herbal tea such as this. Another store that recently opened up in Old Town Pasadena is Saje. 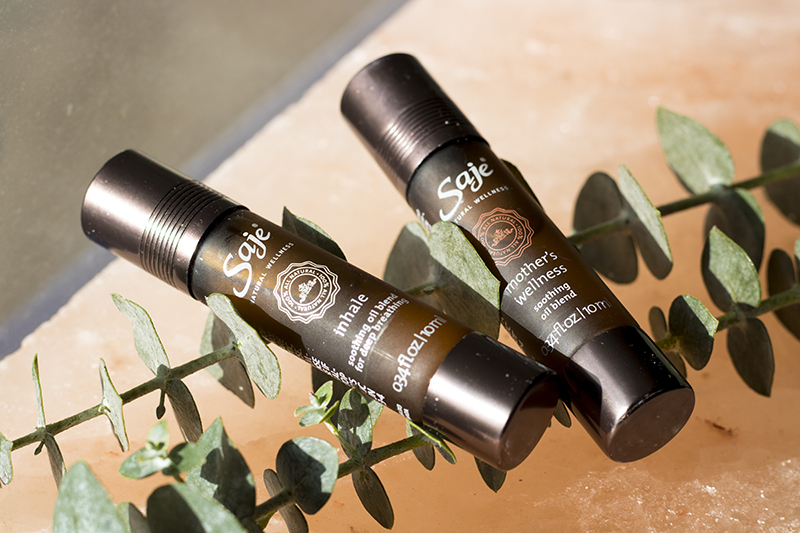 Saje is a natural wellness store that sells aromatherapy and essential oil based products. Do I buy into homeopathic remedies? Not really, but I appreciate beautiful scents and recently invested in two oil blends. I've had a lot of allergies this season so I picked up their soothing oil blend in Inhale, which contains lavender, lemon, and peppermint as their main ingredients. Though I'm not a mother, I did purchase their Mother's Wellness blend, which contains rosewood, grapefruit, and lavender, in a less concentrated formula. The proper way to use these oils is to apply some to your palm, rub your hands together, and then cup your hands around your nose and inhale. I like to use these before bed or whenever I want a little pick-me-up in the middle of day. Depending on your budget, these might be pricey, but a little goes a long way so I anticipate these lasting for quite a long time. 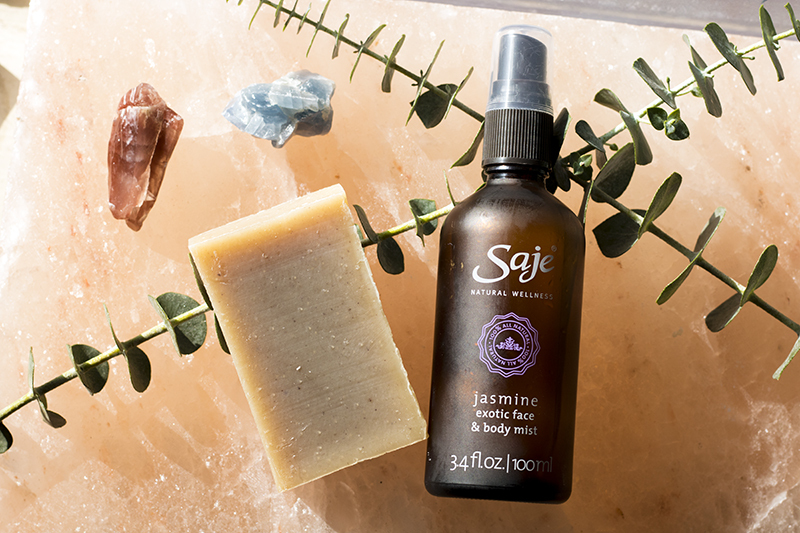 Another two things I've been enjoying are the soaps and mists from Saje. (I promise they're not sponsoring this!) I've switched over to using bar soaps completely since discovering this brand. My favorite bar soaps are Get Grounded (shown here) and Rain Forest. The soaps are triple-milled, non drying, and scented enough to be soothing without overpowering the senses. I find that they lather up really well, too! I've repurchased these soap bars multiple times which is testament to how much I love them. My last favorite has been the Jasmine mist. It's a single note, floral scented mist that I like to use before bed. I typically hold it above my head and spray it in a mist to perfume the air before I tuck in. You'll find that all my luxuries have a central theme: slowing down, calming, and soothing. I enjoy my work, but it's not a job without stress. I've learned over the years that maintaining work-life balance when you're incredibly busy can include small moments of peace. When I was making the final push to finish a manuscript, I did it with good tea on hand. When I'm stressed before bed, I use aromatherapy to delight the senses. For me, practicing self-care when you're busy to take a vacation means introducing tiny luxuries that I can enjoy while I'm working. It doesn't always mean taking extra time out of your day, but instead, making what you need to do more enjoyable. Here's what I'd like to know from you: what scents do you find soothing? What are the tiny luxuries you add to your everyday life? I get this, completely. Little things mean so much. I desperately need that tea in my life. Personally, I love floral and earthy scents, and nice facial oils and candles are part of my (almost) daily routine. PS LOVE the splash of color in the layout! Really love what you have done with your blog design and the colours you have chosen. I agree, self care can just be about doing little things that have fallen to the wayside. Lavender would probably be my top scent. My luxury these days is focussing on my skincare, whether that is using my face oil (currently using tamanu) or simply moisturising my legs, which honestly I do not do often enough. That tea sounds amazing! I've never heard of European Rose tea before nor have I heard of this tea shop but it sounds amazing. I'll have to get my hands on this someday! For me, my favorite scents would be the tropical ones - mango, coconut and pineapple. Just a whiff of those and I'm in heaven! I also love oils. I bought a small bottle of evening primrose. I put it on my wrist or neck when I want to be relaxed. I love the smell of it. Yes yes yes! Enjoy all of the tiny luxuries because they will push you through your days :). When you say small luxury, you're not kidding with the bottles of Saje! Ok, I need to go visit Old Town because what are these hidden gems I've never seen before??? I am glad that you've found some products that help relax you a bit :). GO YOU for rocking self-care :). To be honest, I count power naps as my tiny luxuries because I need more Zzzz's!